Founders Robyn and George Langlands were the first faces of Kaibosh. They began collecting quality surplus food from Wishbone in 2008 and passing it on to women in need at the Wellington Women’s Refuge. Robyn and George volunteered their time to set up and grow Kaibosh. We would not exist without the vision, hard work and foresight of these incredible people. What inspired you to start Kaibosh? 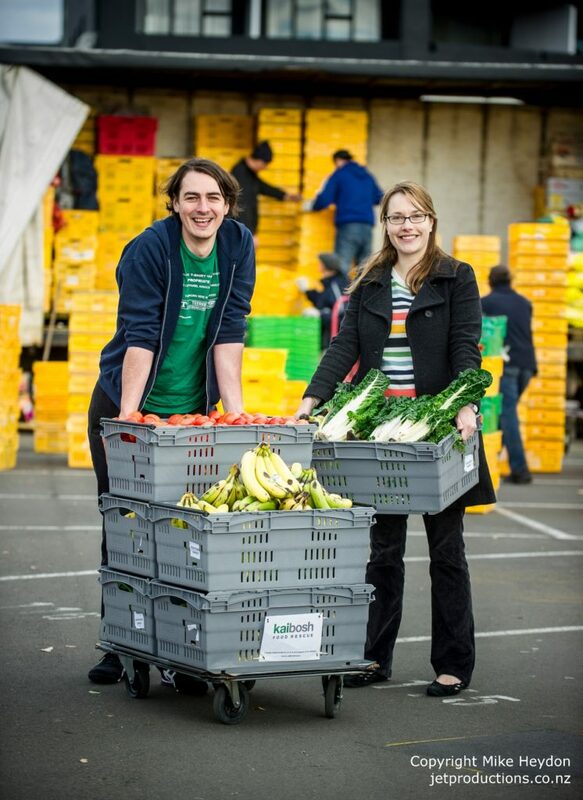 When we realised that there was a whole heap of food going straight to the landfill every day, the idea of collecting food and redistributing it seemed so obvious. Our initial thought was that there must already be a Wellington organisation in place. After doing a little research, we found food rescue organisations existed overseas but couldn’t find any in New Zealand. We figured, what worked in New York, London, and Sydney could (with a bit of adaptation) work in the Wellington environment. What’s one of your stand-out memories during your time at Kaibosh? In the early days we didn’t have heaps of volunteers and one rainy Saturday the people who were supposed to help with a market pick-up didn’t turn up. So I had to do the market run by myself, which wasn’t so bad. The tough part was sorting through 10 crates of past their prime plums by myself. It took most of the afternoon and I had purple stains on my fingers for the next week. Winning the 2012 Trustpower National Community Supreme Award was a real highlight. At the awards ceremony there were more than 20 other charities from all around the country. We felt so privileged to be there, and then we won! It was validation that people really believed in the idea of Kaibosh. After winning the award we got a lot of media attention. We were flooded with requests from groups all around New Zealand who were inspired to set up something similar in their own communities. It was really great to see! This was taken at the Wellington Harbourside Market. We remember feeling very awkward standing there having our photo taken while people milled about us, doing their fruit and vegetable shopping. The lotteries board wanted to include a photo of Kaibosh in their annual report. They organised for a photographer to come and take photos while we did a market run one Sunday in the early days of Kaibosh. Lotteries and the photographer were kind enough to allow us to use the photos for our promotions at no cost.